Like your refrigerator, heat pumps use electricity to pump refrigerant and transfer heat from one space to another. When we transfer heat from within our home to the outdoors, we call it "air conditioning". Conversely, when we transfer heat from the outdoors to within the home, we call it a "heat-pump". Because refrigerant is naturally much colder than outdoor temperatures even on a very cold day, it actually absorbs heat from outdoors, and transfers the heat it absorbed outside to within your home. The refrigerant`s physical properties do this naturally. What you pay for is the electricity to pump refrigerant via copper tubing from outdoors to indoors. Because we move the heat rather than create it (as electric baseboard or resistant heat does), we can deliver up to 4 times the heat for the energy we consume! Mitsubishi Mr.Slim MXZ8B48NA - Inverter Technology. INVERTER-driven compressor systems in the outdoor unit detect subtle changes in temperature and, like a cars cruise control, automatically adjust compressor speed - unlike conventional units, which start and stop repetitively. Special components within the compressor increase the magnetic flux and reduce its weight, allowing the compressor to generate higher energy efficiencies with better performance than ever before - at low levels of sound during start-up and running. "Soft start" reduces the instantaneous peak demand associated with AC equipment starts. The compressor starts at minimum speed, avoiding high inrush current associated with standard compressors. The Mitsubishi Mr. 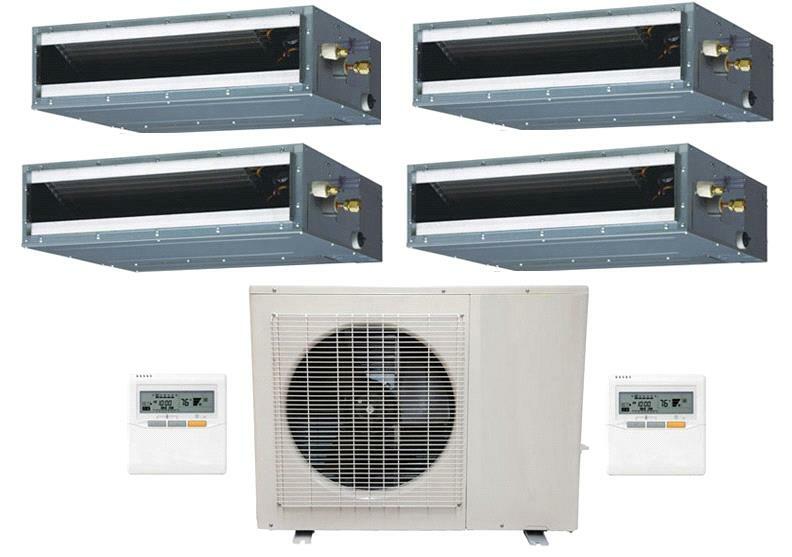 Slim MXZ8B48NA 48,000 BTU Eight Zone Outdoor Unit is not a complete system. While flexible, this product will only work with certain combinations. Please check the submittal or contact E-ComfortUSA to confirm that your product combination will work. 7 Years CompressorImportant Note: The Mitsubishi MXZ8B48NA is not a complete mini split system. 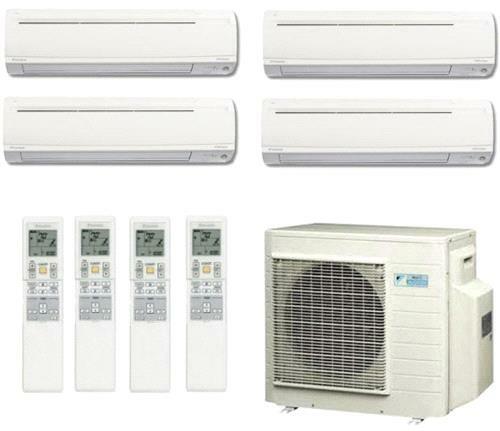 It contains only the MXZ8B48NA Outdoor Unit and requires a compatible Mitsubishi Mini Split Indoor Unit. The high efficiency of these Mitshubishi Mr. Slim Mini Split Ductless Systems like MSZGE06NA helps them pay for hemselves by slashing electrical costs. Strong, quiet and efficient DC motors are used both indoors and outdoors. This Mitsubishi's Super High-SEER mini-split heat pump will provide you with 7,200 BTU of heating for winter and 1/2 ton of cooling for hot summer and it comes with 1-MSZ-GE06NA wall mounted console unit with wireless remote control. This unit can be connected to the any modern MXZ - outdoor condensing unit. Complete system creat the perfect clymate control for your space. High performance fan blades, condensers and evaporators Combined with variable speed inverter-driven compressors makes for unmatched performance. Variable speed compressors automatically adjust to fluctuating room capacity requirements. Since mini splits have little-to-no ducting, they forego those energy losses typically associated central forced-air systems. Duct losses can easily account for more than 30% of energy consumption, especially if the ducts are not sealed tight or in an unconditioned space such as an attic or crawlspace. What is Mitsubishi Mr. Slim MSZGE06NA Inverter Compact Wall-Mounted Console Heat Pump? The new range providing a wide range of cooling and heating capacities, each wall-mounted indoor unit mounts high on a wall and connects to a branch box or the outdoor unit by a refrigerant line run via a 3" hole. The MSZ units provide highly efficient solutions to cooling and heating needs and provide personalized comfort for the individual zones in which they are installed! Mitsubishi Mr. Slim MSZGE06NA Inverter Compact Wall-Mounted Console Heat Pump - Maximum Heat Output, Optimum Air Distribution. Stylish, slim and elegant, floor console units are designed to complement any interior decor. I.A.Q. Blue Enzyme Anti-allergen filter. Mitsubishi indoor units use a sophisticated multi-part filter system to remove contaminants such as allergens, viruses and bacteria from the air as it circulates. The combination of Catechin + Anti-Allergy Enzyme Filters ensure effective deodorisation, active filtering and the dramatic reduction of common allergens and bacteria. This is the key to cleaner and healthier air. A hybrid-coating process makes the catechin filter washable and, if properly maintained with monthly cleanings, effective for more than 10 years. Maximizes energy savings by making sure only the energy needed to cool or heat an area is used. Mitsubishi Mr. Slim Programmable ComfortSmart Set featured on MSZ-GE systems provides the option to program multiple settings into one "quick" press feature providing an additional level of comfort control. The POWERFUL mode (found on select systems) is available to cool or heat any desired space quickly by lowering the set temperature in cooling mode or raising the set temperature in heating mode, both by 7° F. In Powerful Mode, the fan speed increases for 15 minutes then resumes standard operation. Mitsubishi Electric offers a comprehensive remote controller that controls temperature, fan speed and more. Choose from four modes: COOL, HEAT, AUTO and DRY. The controller also has a 12-hour ON/OFF timer for one-button control of your personal comfort. All Mitsubishi Mr. Slim Systems Have ISO and ETL Approvals for U.S. and Canada. Environmentally Friendly and ARI performance certified. Sleek, Modern Design with Easy to Access Controls and Visible System. Auto Louver: Up/ Down - Wall Mounted Units Only. Coil Dry Mode - Wall Mounted Units Only. Quiet Mode - Wall Mounted Units Only. 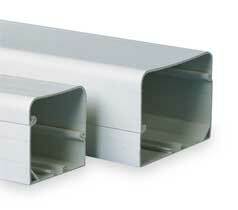 Return Air-intake - Concealed Units Only. Branch Duct Capable - Concealed Units Only. Mitsubishi Mr Slim MSZ-GE06NA-1 Compact Wall-Mounted Console Unit. Mitsubishi Mr Slim Wireless Remote Controller. PAC-AKA31BC - 3 Port Branch Box. The high efficiency of these Mitshubishi Mr. Slim Mini Split Ductless Systems like MSZGE15NA helps them pay for hemselves by slashing electrical costs. Strong, quiet and efficient DC motors are used both indoors and outdoors. This Mitsubishi's Super High-SEER mini-split heat pump will provide you with 18,000 BTU of heating for winter and 1-1/4 ton of cooling for hot summer and it comes with 1-MSZ-GE15NA wall mounted console unit with wireless remote control. This unit can be connected to the any modern MXZ - outdoor condensing unit. Complete system creat the perfect clymate control for your space. High performance fan blades, condensers and evaporators Combined with variable speed inverter-driven compressors makes for unmatched performance. Variable speed compressors automatically adjust to fluctuating room capacity requirements. Since mini splits have little-to-no ducting, they forego those energy losses typically associated central forced-air systems. Duct losses can easily account for more than 30% of energy consumption, especially if the ducts are not sealed tight or in an unconditioned space such as an attic or crawlspace. What is Mitsubishi Mr. Slim MSZGE15NA Inverter Compact Wall-Mounted Console Heat Pump? Mitsubishi Mr. Slim MSZGE15NA Inverter Compact Wall-Mounted Console Heat Pump - Maximum Heat Output, Optimum Air Distribution. Mitsubishi Mr Slim MSZ-GE15NA-1 Compact Wall-Mounted Console Unit. Guidance, Support, Assistance, Deals Etc.